Next review Empire Today - Worst experience in home improvement EVER! For over 55 years we’ve been committed to providing outstanding customer service from start to finish. 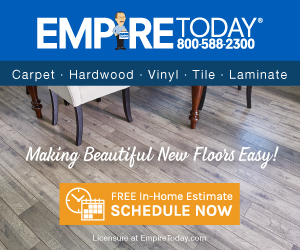 Our mission is to make beautiful new floors easy for all of customers and we accomplish this by putting our customers first. We’re disappointed to hear about the delay in your installation, and regret to hear that you’ve decided to cancel your order. This is not the experience we wish for our customers, and we’ll be further investigating your concerns. We met with Dinah to review samples and schedule our installation. Due to the challenges with the layout in our home we scheduled the installation over 2 days and included the installers to move the furniture. I spoke with an Empire represenative 2 days before the install to confirm the plan. On the first day off the install we had prepared 2 bedrooms with only bed frames and matresses to be moved out. The installers arrived and I showed them the areas to do that day. They told me that they were only there for one day and that because the third bedroom was not ready they would not be doing the work. I suggested they do the first bedroom and when working on the second room and stairs we would shift the furniture over so the last room would be available to carpet. Neither worker spoke very good English and refused to talk with me about completing the work. I had a call from Empire who explained that this was only to be a one day job, that Dinah was incorrect to schedule it as she had and that we'd need to reschedule. She also was unwilling to work with me. The workers proceeded to leave the job. Not only had this been a horrible experience but I'm out 2 days of work, I don't have my new carpets and my life has been unnecessarily disrupted by tearing apart my rooms. I've cancelled my order and will purchse my flooring elsewhere. Review #1121808 is a subjective opinion of User1121808.